I could be all tribal and also claim like the chancellor that the economy contracted by 0.5% in the last three months of 2010 because of the snow. But while I can see this being a factor, Manufacturing still went up by 1.5% which means the weather was not an overriding factor as manufacturing workers still turned up to work and good where still delivered and made. I think that this is generally a very bad sign for the coalition as well as the country. It's a shock for a reason, because its so unexpected. The construction industry fell the most, decreasing by 3.3% in the quarter. This I expect is down to so much spare capacity in the commercial sector and the very slow housing market. Of course politically the government will claim that this is not down to policy and they won't change their plans. But If this continues I expect the government to change their plans accordingly. This is because if the parties in the coalition want to win votes then they will need to keep the economy on track, otherwise you can expect Labour to win a majority in the next general election. Coalition, You have been warned! Landlord Chris Jefferies who was arrested for questioning on the murder of Joanne Yeates has the right to be a bit miffed at the detail to which the papers explored his life. Surely it is not right for newspapers to speculate so much about an unconvinced man's life history. I noticed the papers have not specualted so heavly about Vincent Tabak who is in court today charged with Joanne's murder. http://m.mirror.co.uk/article?a=m4:22816644 - The Nutty professor? http://www.thesun.co.uk/sol/homepage/news/3324998/The-strange-Mr-Jefferies-is-Joanna-Yeates-murder-suspect.html - The Strange Mr Jefferies, need I say more? http://www.dailystar.co.uk/news/view/169732/Jo-Yeates-Police-quiz-landlord/ - This article includes speculation that he is gay! Surely the media needs to be more careful as these kind of stories could one day lead to a nasty case of vigilantism and if nothing else cause a big effect on his day to day life. It's not fair when your innocent of the crime to have your whole life history explored and reported by the national media. There's plenty of political news today. For Labour Alan Johnson has resigned as shadow chancellor, Ed Balls is the new shadow chancellor. Tony Blair is back in the hot seat of the Iraq inquiry. For the Tories, Andy Coulson the prime minister's communications chief has resigned over further News of the World phone hacking allocations. And plans are being drawn up for a massive change to the management structure of the NHS. So on the face of it it appears to be a better news day for the Liberal Democrats. Bracknell Blogger has decided that today is a good day to bury bad news for the Lib Dems. I have had to resign from the local party executive in Bracknell because after the arrival of my new son I have decided to move out of the area and I simply do not have time to help and can not stand in the local elections in May. I have enjoyed my time with the Bracknell Lib Dems. I enjoy meeting people and talking politics on the doorstep. I have also made new friends in the party and I will miss them. But all this will have to take a back seat for now. I wish them luck and I hope I will have the time to help again. Questions for Dr Phillip Lee MP. 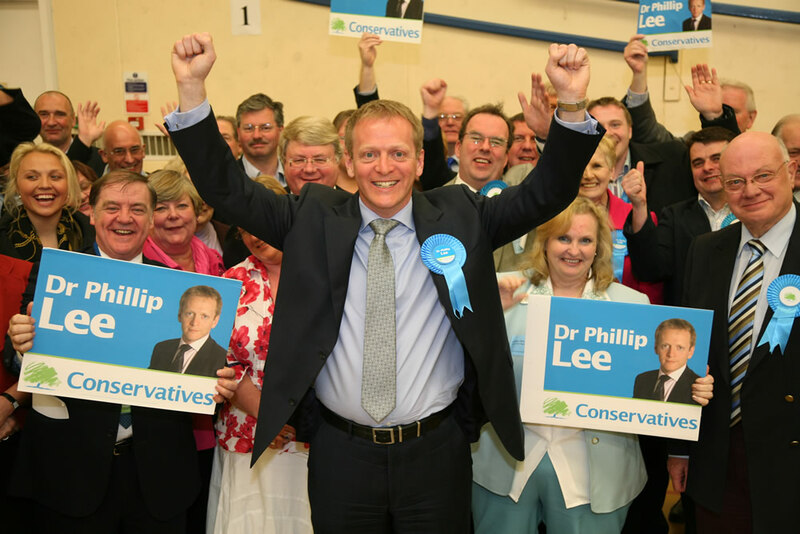 In a few weeks time I will be speaking to local Bracknell Conservative MP Dr Phillip Lee about what it's like becoming a new MP and how this has changed his life. I will be asking him a few other questions on general policy such as the NHS reforms. If anyone has any other question that they would like to ask him then please post them in the comments below. Over the last few weeks I was ask a few questions by the Bracknell Standard as part of the papers 'What does Bracknell think' weekly panel. VAT has risen from 17,5 per cent to 20 per cent, is this a fair way for the government to try to reduce the national deficit or will it put people off buying consumer goods? Surely it depends on what you buy and how much you spend. Children's cloths and Food do not have VAT added to them yet they still seem expensive. At least if someone who is wealthy and spends their wealth won't be able to avoid this tax on their larger purchases, like they can with their income. The rise ensures that we are all paying the national debt off not just some and therefore gives us all ownership of it. Governments often choose VAT because its the tax that provides the quickest way of raising funds. If the deficit reduces sooner than expected, expect to see this cut sooner than expected (I hope). We want to know what people's feelings on the issue are. There are many facets to it - is the system fair? Have the Lib Dems betrayed voters? Will the new system benefit the country? Should potential students start looking into alternative futures? I am a Lib Dem activist and I'm not looking forward to selling the tuition fee rise on the doorstep. As someone who believes in free education I do not agree with such a large rise. But I do understand why there has been an increase. The increases aside, I do feel the new system is fairer. you don't have to pay it back, What you pay back is linked to your earnings. This should not put people of from going to university once students examine the system in detail. I do not feel the Lib Dems have sold out, I feel we are taking a huge political risk for the good of the country. A minority Conservative government would of lend to another election and 12 months of indecision. I have yet to met a Libertarian that believes in climate change. The very subject can make some very angry indeed. Libertarians have a natural distrust of control by government. Combating climate change could lead to more government control over our life's or that's the fear. As a consequence on face value it would appear that Greens and Libertarians have little in common. But this is not the case as Green Libertarianism has shown. This is based on the environmental values of the Green party and the civil liberties platform of the Libertarian Party in the United States. Its a consolidation of socially progressive values with economic liberalism. If you think about it it does make sense. A pure Green if they could will grow their own food, build their own property, have little to do with the national politics, supply their own electricity and therefore separate themselves from a controlling society and require less from the state in return, thereby being more Libertarian by consequence. It does make perfect sense. Have a read of this article here on Greens and Libertarians who are coming to arrange this between themselves. So next time Greens or Libertarians bash each other for believing or denial in climate change, why not think about the way you live and see how you could both benefit from a different arrangement. I'm very pleased this government is going ahead with Labour's idea to let the father take up any remaining unpaid leave if the mother goes back to work early. The government also plans to consult on a "proper" system of shared parental leave. This is something I very much support see Paternity leave a personal view. If couples can share maternity leave then there is less reason to disgriminate against mother's by employers as dad's can also take time away from work. If used wisely then shared maternity leave could help the income of the family like reducing the cost of nursery. Also the flexibility of chunks rather than a single block of maternity leave will help employer's and employee's. Because the employee suddenly becomes more flexible at work while taking leave. Again this will help families manage their time looking after the children. Labour abstained as a whole on the recent parliamentary vote on the EU which allows for a referendum on any future transfer of powers from London to Brussels but only if judges decide that this should be the case. The story of course was the Tory revolt of 27 MP's on this sensitive subject for the Tories who promised a law that could trigger a referendum on EU treaty changes. I also want to note that I myself am sceptic of the European project because I am also worried about the loss of government control to the EU parliament. Reading blogger Not Yet Out of the Woods has come up with an idea to make VAT more progressive. A Luxury rate of VAT that could be charged on expensive luxury items only. It has been done before by the 1974 Labour government. See the post 'Progressing the VAT debate'. This is something I advocated as an idea on Twitter but was shot down by people claiming that it would be 'to difficult to administer'. Well I don't see how. We currently have many different rates of VAT. All that would be required is a list of services or items and perhaps items over a certain value like expensive cars which could have a higher rate of VAT applied to them. It seems very simple to me. Remember when this happened see here. I can remember wondering how I would react. The answer to which is, I honestly don't know. 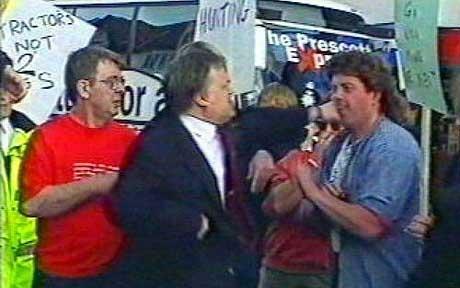 But Prescott was the Deputy Prime Minister at the time and even called his autobiography, 'Prezza, My Story: Pulling no Punches'. So I suspect he was quite proud of his reaction after being provoked. I can remember my friends who were not Labour supporters agreeing with his reaction. However I wonder what the reaction would be if our current deputy PM reacted in the same way? I suspect it would be a whole lot worse. Here is the advert and the remix. One of the great things about having a new born baby is discovering all the late night TV you didn't know existed. One program which was on the parliament channel last night was the intelligence squared event debating the motion 'An elected House of Lords will be bad for British democracy'. This is with Vernon Bogdanor, Shami Chakrabarti and Simon Jenkins speaking for the motion, and Lord Adonis, Polly Toynbee and Billy Bragg speaking against it. Broadcast on 23rd November. The coalition agreement clearly outlines a provision for a wholly or mainly elected second chamber using proportional representation. As an interim measure, there has been and will continue to be an appointment of new peers to reflect the shares of the vote in the last election. But there is much more to arranging a working and worth while second chamber than whether its elected or not. There are questions over power, appointments or candidate selection. If elected when do we vote for the members (for example a 3rd every 5 years) giving members of the lords more time in office gives them more independence. In effect its an argument for or against democracy. Please do watch the debate here on the BBC's democracy live website and let me know your conclusions. Personally I now favour a partly elected second chamber with a 3rd elected every 5 years. A List of reform options can be found here. This is in relation to the closing down of 60 shops by the HMV group. Now I know there may well be man things you could blame the coalition government for. but it is not fair to blame the government for everything that happens. I also don't blame the last Labour government for Virgin becoming Zavvi and Zavvi later closing all their high street stores (selling the same products as HMV). Firstly the government austerity measures had not hit at this point during the lead up to Christmas or the sales (although I expect the snow didn't help them). At the end of the day I blame the product these shops are selling and the fierce competition in the market. HMV are selling CD's, DVD and console games. All of which are cheaper on the internet (HMV are on the internet but are not a go to store for many) and they have to compete against ITunes, supermarkets and specialist game stores. So lets not blame the governments for everything. Some things are down to other factors such as a sustainable business.